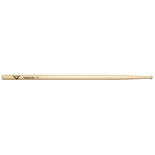 Vic Firth 5B Wood Tip Drumsticks feature a tear drop tip. 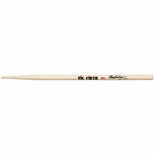 The Vic Firth 5B is ideal for rock, band and practice. 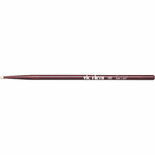 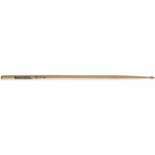 Length: 16" Diameter: .595"
Vic Firth 7A Wood Tip Drumsticks feature a tear drop tip. The Vic Firth 7A is perfect for light jazz and combo. 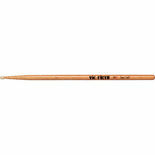 Length: 15 1/2" Diameter: .540"
Vic Firth SDW Dave Weckl Wood Tip Drumsticks feature a barrel tip for broad cymbal sound. Fast, with great leverage. 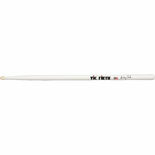 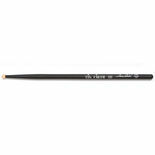 Length: 16 1/4" Diameter: .560"
Vic Firth SBR Buddy Rich Wood Tip Drumsticks are a modified 5A with a larger tip, neck and shoulder. Length: 16 5/16" Diameter: .590"